I know there are many topics about this but none of them helped me to solve my problem. All I want is to make a simple C++ program that uses cURL with static libcurl (without DLL files) on Code::Blocks - Windows 8. I've spent around 20 hours trying to do this but all I found is unuseful stuff and stuff I don't understand. I may have edited some other stuff, but nothing important. mingw32-g++.exe  -o Debug\MyTestProgram.exe Debug\Main.o  -static  "..\..\..\..\Program Files (x86)\CodeBlocks\curl-7.39.0\builds\libcurl-vc12-x86-release-static-ipv6-sspi-winssl\lib\libcurl_a.lib"
And more than 50 errors. What I did wrong and how can I fix it? Feel free to ask me for more details if needed. 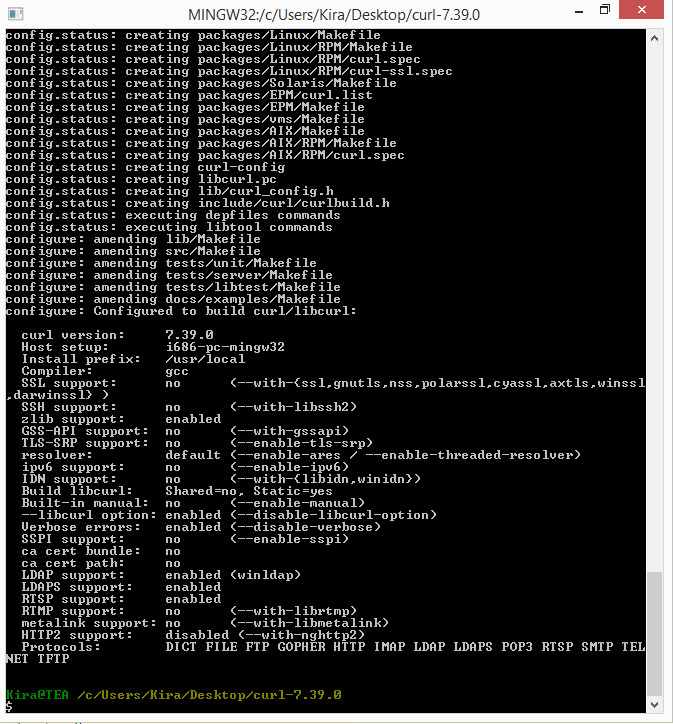 To build libcurl with gcc on windows, you need a command line tool. You may use Git-Bash or MSYS. Your choice. I'll be using MSYS: MSYS1.0.11. 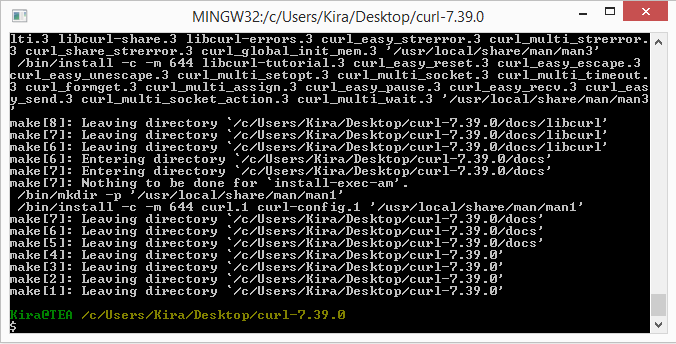 I'll be building Curl: Curl-7.39.0. Now you have a command-line tool "make" installed and is compatible with your gcc/g++/mingw. If using 32-bit gcc/g++ then change to: --build=i686-pc-mingw32. If using 64-bit gcc/g++ then change to: --build=x86_64-w64-mingw32. If using SSL, change --without-ssl to --with-ssl and add -DOPENSSL_PATH=Path_To_Open_SSL_Here. If you need to specify a special path to your ZLIB then add -DZLIB_PATH=Path_To_ZLib_Here. If you want to build STATIC then use --disable-shared otherwise don't use it OR use --enable-shared. $ ./configure --prefix=/usr/local --without-ssl --disable-shared --build=x86_64-w64-mingw32 CPPFLAGS="-I/usr/local/include" LDFLAGS="-L/usr/local/lib"
Those locations should have all the files necessary for you to use libcurl with gcc/g++/mingw. You may either link to them in that location or move them. You can copy the files in "include", "lib" and "bin", into your mingw installation folder respectively (include + curl-folder to include, bin to bin, lib + package-folder to lib). Not the answer you're looking for? Browse other questions tagged c++ curl libcurl or ask your own question. How can I build curlpp on Windows for gcc?